Exhausted young woman holding glass of good wine and keeping eyes closed while sitting on comfortable sofa. Fit ethnic woman in sportswear looking exhausted while having rest on bench in street gym keeping eyes closed and moping her brows. Content young model holding smartphone and wearing headphones relaxing on sofa and listening to music with eyes closed. Excited young woman in checkered shirt holding controller and playing video game while sitting on comfortable sofa. 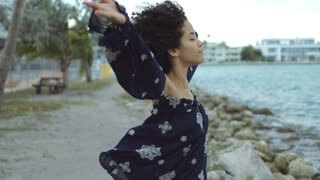 Side view of black girl with short curly hair holding hands apart and keeping eyes closed standing on coastline in wind.